We specialize in providing quality DPF filter cleaning, quick turnaround time, and reliable service at economical prices. The professional Diesel Particulate Filter Cleaning System we use and the recent technology that our work process uses, ensures that all customers get the maximum life possible between DPF cleanings and extends the overall life of the DPF filter. We handle most DPF on the market today! 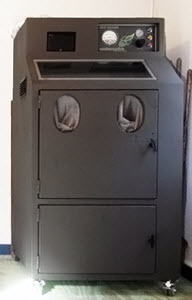 We use the only DPF Cleaning machine in the industry that has "DUAL FORCED" technology. First Call Truck Parts is your choice as a DPF Cleaning Service Provider! Your DPF will be cleaned to what the original manufacturer suggests. Your DPF will be returned to you quickly. Your filter's overall life will be extended. Your engine power will be sufficiently burst to maximize fuel efficiency.